This E-Zine follows on from the May issue that discussed choosing an aquarium filter that is a good fit for your goldfish setup. Once you have selected your filter, you need to fill it with the right filter media otherwise it won't be able to do its job properly. We know from last month's E-Zine that a filter's job is not to filter dirt particles from aquarium water but to remove dangerous waste, and a secondary benefit of this is the water becomes clear. Filter media has a similar misconception, with filters being filled with media that isn't suited to the filter's primary job of removing waste. If the wrong type of media is put in a filter, or the media is put in the wrong area of the filter, rapid clogging will result with the filter struggling to work efficiently. I recently pulled apart a brand new canister filter I was fixing for an aquarium shop and noticed it had come with filter media. In the bottom tray was a foam pad with two bags of charcoal. The next tray had medium sized media, and the top tray had another foam pad. If this filter was purchased by someone who didn't know much about filters, they would assume the manufacturer knew what they were doing and leave the media where it was. This setup would be totally unsuitable for messy goldfish. A more suitable arrangement of the media would be to put some large media in the bottom tray, move the charcoal to the top tray and leave out the second foam pad or place it in the top tray with the other pad when the charcoal was removed. (The top tray was designed for two pads). I will describe the job of the media for a typical canister filter with a bottom up water flow. Most canister filters pump the water down to the bottom of the canister where it flows up through the layers of filter media and out through the top and back to the aquarium. 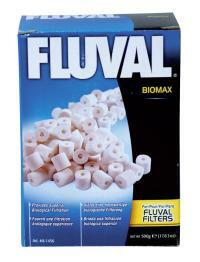 Smaller filters often come with an open cell foam pad which takes up all or most of the filter. These filters are fine for small setups, but larger aquariums need filters a little more substantial, with the correct filter media installed. The following principles apply for any filter that has room for more than one type of media. 1. Large (pre-filter) media - This media's job is to slow the water flow through the media by spreading it across the filter body. It is placed in the filter so that it is the first media water hits after it enters the filter. 2. Medium media - Placed in the middle section of filters, this is the first layer designed to be colonized by large numbers of bacteria. 3. Open cell foam pad - Placed in the last section of most filters. The pad is also designed to be colonized by large numbers of bacteria. The pads quickly clog if there is no other filter media before them. Some aquarist decide that instead of buying filter media, they will use some other material they have on hand. If you use aquarium gravel as a pre-filter media, you will find the water flow won't be as good as say with Fluval pre-filter media because the Fluval media has a hole through the middle, enhancing water flow. If you use aquarium gravel in the middle section of your filter, it won't be colonized by as many bacterial because of its smooth surface. Be very careful about using any rough pebbles as filter media because they often leach out heavy metals. Filter media has been developed over many years, so as long as you buy the big brand products you can be confident it will work. I've added a page on aquarium filter media. The page discusses the benefits of using charcoal in your filter and shows examples of what filter media looks like and what is available. Here is the link…Aquarium Filter Media.